We love our red cards at Icygeek. Sadly, WotC hates decent burn and there are no goblins on Innistrad, so our love for this set was naturally going to be limiting (until we saw the full spoiler we were going to order the Fat Pack…not as likely now). 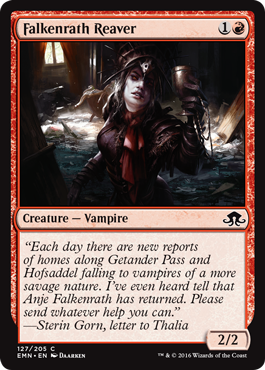 However, we try to be recreational in our approach, so instead we are going to make a list of red cards in Magic: The Gathering‘s Eldritch Moon that we are intrigued in. All the rest can go to Cardshark’s cheap bins as far as we are concerned.